I’m a big believer in mission statements and the value that they have for product managers, the agile team, stakeholders and most importantly users. I work with 3 different teams all building new services to meet the needs of our users. Having a strong, clear mission statement that a team can work towards is like having a constant product manager presence in the room. It’s the best way to ensure a team and a service stay on track and don't get distracted. In DWP Digital we are lucky to have an excellent team of content designers led by Melanie Cannon who work with service teams to help them define their focus. Melanie’s blog talks about what a mission statement should look like and can also help you with your service name and description. 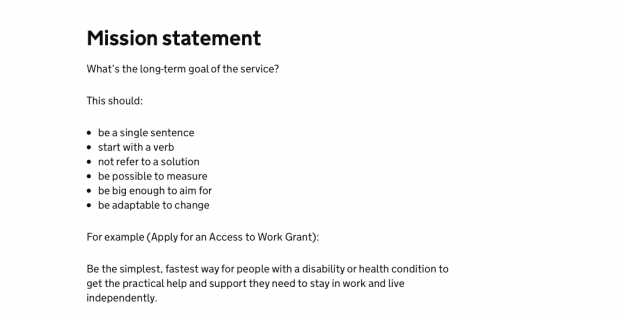 Melanie Cannon's tips for writing a mission statement from her DWP Digital blog. Mission statements help the team to stay on track but product managers need this too. Everyone gets lost or confused at some point and for product owners a mission statement can be a beacon of light in the dark. Your mission statement is the long-term goal of the service. When you’re stuck between options a clear mission statement can make it much easier to make a decision on which option is the right one to reach your goal. How do you get a mission statement? Don’t write it too early - before having a mission statement you really need to understand the problem and have done a good chunk of your user research. Agree with your stakeholders an outcome that you will achieve, not a thing you will build. 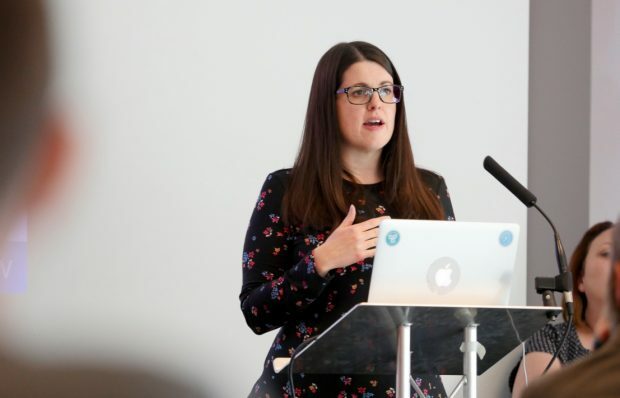 Get help – in DWP Digital we love using our content designers, but if not them, find someone independent to facilitate and use the guidelines as recommended by Melanie. Remember that it can take time to get it right, so keep testing it. I hope that my sessions at the cross government event helped those product managers who were still trying to get to grips with their service and mission statement. As we continue to develop our skills in DWP Digital and other departments we all recognise the responsibility to share our individual learning. I love listening to others' experience and for me it's one of the best ways to learn. Thanks to HMRC for hosting the last event. I’m already looking forward to the next one and can’t wait to meet even more product managers and hear their stories. Since the service manual refers to product managers rather than product owners, should it not have been a cross government event for product managers? I know that this might be seen as rather pedantic, but I think that it is really important to use consistent terminology to avoid confusion. I know that DWP have taken the decision to use different descriptions but that should not then roll out across government - unless the service manual is also updated. Hi Paul, thanks for the comment - good point. We do refer to ourselves as Product Owners in DWP but as this was a piece about the cross Government community I should have used the more common term of Product Managers. I've updated the blog-post to reflect this.